Sparks from electric power lines likely started the blaze that became the most destructive wildfire in Texas history, fire officials said Tuesday. One fire began when winds toppled a dead pine tree onto power lines, showering the dry vegetation below with sparks. The other fire ignited when fallen tree branches became tangled with power lines, showering dry grass and branches with sparks. 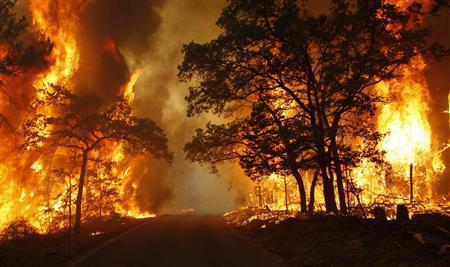 The fire near Bastrop, about 25 miles east of Austin, destroyed more than 1,500 homes and killed two people. Republicans again threaten a government shutdown over funding of disaster aid. Both the Senate and House must approve a continuing resolution to keep the government running past September 30, but Republicans are refusingd to replenish the Federal Emergency Management Agency (FEMA) fund to help areas in the mid west, south and northeast recover from drought, wildfires, tornadoes, hurricanes and floods. Senate Majority Leader Harry Reid (D-NV) insists the GOP approve $3.65 billion for FEMA. With recent hurricane and tropical storm related flood damages measured in the billions for the northeast alone, questions are being raised about how to pay for this latest round of disaster aid. Beyond the northeast, wildfires are raging in Texas, parts of the mid west and south remain in splinters from April's intense tornado outbreaks, while other parts of the mid west are devastated by spring flooding along the Missouri River. If it seems like 2011 has been remarkable in terms of widespread meteorological chaos, that's because it has. According to a report from the National Climatic Data Center, 10 separate weather events this year have each inflicted more than $1 billion worth of damage. That beats a previous record of nine events in 2008, and it's only September. In total, the 10 major events in 2011 has, so far, caused more than $35 billion of destruction, which is five times more costly than all of last year's disasters combined. Additionally, the Climatic Center finds the number of billion dollar disasters per year has been rising due to a more violent climate combined with population increases and economic development in disaster-prone areas. That $35 billion estimate is likely to increase given there's no end in sight to the Texas drought, hurricane season continues for another two months and 2011 still has three and half months to run. Driving the urgency of legislation to replenish FEMA’s disaster fund is that it will likely run out before the end of this month. FEMA spokeswoman Rachel Racusen has said that the disaster fund has less than $400 million in it and could be depleted by Sept. 26 — or sooner if another disaster strikes. If the fund runs out, FEMA would have to suspend aid to victims of Hurricanes Irene and Lee, which have hit the East with major flooding and other damage, much of it concentrated in states like Vermont, New York, Pennsylvania and New Jersey, which tend to be hit less frequently by disasters than other states. And FEMA still has emergency costs in Joplin, Missouri and Tuscaloosa, Alabama, which were hit by devastating tornadoes this spring. The FEMA account is so low that new rebuilding projects like rebuilding sewer systems and other public infrastructure have been put on hold to give emergency help like shelter and cash assistance to victims of Irene and Lee. The White House requested $5.1 billion in additional disaster aid money only last Friday, which had been a source of frustration for lawmakers responsible for funding disaster accounts. The administration requested just $1.8 billion for FEMA’s disaster funding in February, well short of documented needs to respond to past disasters like hurricanes Katrina, Rita and Gustav and the massive Tennessee floods of last spring. The tornadoes in Joplin and across Alabama this spring only made the problem worse. With the Northeast still reeling from the impacts of Hurricane Irene and the remnants of Tropical Storm Lee that stalled and sent plumes of additional precipitation to the Northeast. The area along the Susquehanna River in Pennsylvania and New York was in the bulls-eye raising flood waters surpassing the previous record event set in 1972 when Hurricane Agnes dropped a torrential downpour on the area. In Wilkes-Barre, PA, 75,000 people were evacuated as the Susquehanna River crested at a record 42.7 feet. Local authorities said that levees were under “extreme stress,” but they held up, saving much of the city. An estimated 5,400 homes and businesses suffered some form of flood damage during the event, and 124 sewerage treatment plants were affected by the flooding, with 14 of them spilling raw sewerage into waterways. Traditionally, the federal government has filled much of the disaster aid gap, but FEMA’s disaster fund is now under $400 million and will be depleted by September 26, even if another disaster doesn’t strike in the meantime. Rebuilding projects have already been put on hold to secure short-term funding for shelters and other emergency help. If Congress does not act to replenish the fund, all forms of aid to the weather and wildfire disaster victims in Texas and around the nation will be cut off. Unfortunately, the acrimonious Tea Party atmosphere on Capitol Hill over budget deficits suggests that relief may not be forthcoming for many hard hit areas. Senate Democrats overcame a Republican filibuster to pass a $7 billion emergency disaster aid package, but the measure is now blocked by House Republicans. Weather disasters in 2010 and 2011 have put a strain on the FEMA budget that has yet to be resolved. With Federal Flood Insurance already billions in debt and the federal government struggling to provide disaster aid, climate change is only increasing the risk that these costs will continue to rise. As climate change increases the risk of extreme weather, which science clearly shows will happen, it remains to be seen how future disasters will be paid for, or whether they will be at all as Republicans continue stall the legislative process.